Robert A. Johnson, who is now eighty, is a noted Jungian analyst, lecturer, and one of this century's most popular depth psychology scholars. Robert was among the first to present Carl Jung's rich but complex theories with simple elegance and grace, opening them to an entirely new and hungry audience. His masterful works-including the best selling He, She, Inner Work, and Owning Your Own Shadow-are known and loved as much for their beautiful retellings of timeless myths and folk tales, as for their deep wisdom and profound insight. Alzak tells of his mentorship with Robert for over a decade. In the Spring of 1990, after having read several of Robert Johnson's books, I went to a lecture he was giving in San Francisco. Fortunately, my friend and I arrived early at the lecture hall and discovered Robert sitting on the ledge, not far from the entrance. In his quiet, yet inviting manner he called us to him. After introducing ourselves and chatting a bit, he began sharing a wonderful story about the ruby ring he was wearing. His ring has several gold lines crossing each other creating a star. He explained, that the crossing between a vertical and horizontal line symbolizes the meeting of two levels of consciousness. The horizontal represents the physical level and the vertical, the spirit level. The purpose of life is to bridge these opposites to create a whole. Working on this integration is the wholeness-making process, or in Jung's words, individuation. We are not whole until we honor both aspects of ourselves and reality: the light and the dark, the masculine and feminine, imminent and the transcendent, body and spirit, inner and outer, mind and heart, suffering and joy. During the lecture, he interpreted the Grail Legend with its implications in our times. He also shared stories of his wanderings through India. I was quite moved by his words and the spark in his presence, as he spoke to us. At the end of the evening, I stole another private moment to tell Robert my reactions to his lecture. He responded by inviting me to visit him to continue our dialogue. I was quite taken by his offer. A few months later I was in Southern California and decided to call Robert and arrange a meeting with him. I drove down to the quiet beach town of Leucadia, a little north of San Diego. Robert explained that Leucadia means, "the resting place of the Gods." On a warm Saturday afternoon, we sat across the seashore in his living room for several hours, sharing experiences, literature, Jungian and Indian wisdom, as well as deep spaces of silence. Many questions were answered for me that day. He prepared a lavish Indian dinner with a dozen condiments, and then transported me to India via his slides of his travels to the East. He offered his guest room to me for the night, so we could continue our dialogue and sharing the next day. At lunch on Sunday, I shared an aspiration that was welling up in me all weekend. I asked him if he would be my mentor in my own psychospiritual journey and in my Jungian-oriented psychotherapeutic work. His facial gestures indicated a clear: YES. After a few moments, he clarified that he would enjoy being my teacher through a relaxed friendship, not a formal and structured format. He worked best in telling stories and speaking personally, rather than intellectually or clinically. My first weekend with him wet my appetite for more of the same. Since 1990, each quarter we've met for long weekends to share our lives, dreams, and work. Some of my most restorative and soul-searching days have been on those liminal weekends with Robert. In between, we would converse on the phone, send letters, and in the last few years, email. These various forms of communication would be embraced by Robert's deep silence, opening up the inner world to me within the first few words. As part of my study, I would slowly read one of his books and save up several themes for us to discuss. His comments were precise, simple, and deep. At times he would offer an unexpected perspective, which would completely re-color my own perception of a subject. Not only is he clear in explaining his ideas, but he is a master at evoking the experience which we were discussing. I would take notes or tape record our dialogues. He urged me to, "build on our discussions and write an article." Our meetings were quite intense and at intervals he would need to "hermit by getting horizontal." Robert is an introvert; being alone and quiet would help him regain his energy. I had ample time for long, quiet walks by the sea. His home was on the cliff of the Pacific, with stairs from his back yard leading down to the beach. Strolling on the sand, I integrated my discourses and experiences with Robert. When we spent a few days together, we would share dreams in the early morning, over Robert's fresh pressed juice. He especially liked hearing dreams at breakfast and said it was best to look at them, "when they are hot off the griddle." As he got to know me through the years, we would delve deeply into "archetypal dreams of transformation" which offered profound guidance, or another view about a struggle in my life. I made key decisions while working with Robert on such dreams. In the last three years, Robert has asked me to reflect with him on his dreams. Themes of completion and death have been constant as he decreases his commitments and hands over the mantle to his students. Recently during his trip to Ephesus, Greece, he had a dream about the major transition occurring in the world. He saw the devastation that would birth a new consciousness. We worked for several days on various aspects of this dream. A chapter of our book together will be devoted to his dream at Ephesus. Robert has worked a with a vast number of individuals throughout his life as a Jungian Analyst. He has trained with numerous analysts such as Fritz Kunkel and Toni Sussman as well as with Carl Jung in Zurich, Switzerland. I would often present particular individuals or couples who were working with me in my practice. Robert would intuit the key issues they were facing and offer analysis, stories, and reflection based on his clinical and personal experiences. This would deepen my work. When patients shared dreams that were complex, Robert would clarify and offer valuable insight. At times he could map out the therapy process of a person, based on a couple of dreams. It was especially at our times of supervision, when I would most observe Robert as a master in his work. Dr. Carl Jung told Robert: "Please remember, it is who you are that heals, not what you know." Being in Robert's presence has often offered healing to me and to those with whom I have worked in the last ten years. This has been one of his greatest gifts to me. 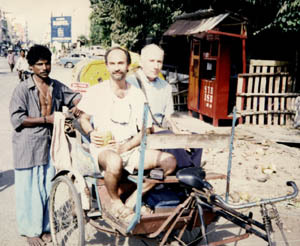 In the Winter of 1996, Robert and I journeyed together to India. We spent approximately six weeks traveling, researching, and resting. He often stays in Pondicherry, a small seaside town in South India. He has adopted a village, and they him, where he does his philanthropic work by supporting a school for the village children. Robert also meets with various people connected to the Sri Aurobindo Ashram to discuss Vedanta (perennial philosophy of India) and its implications for Westerners and Indians. I was interested in the process of personal transformation from cross-cultural perspectives. I interviewed Indian families and individuals to understand their process of forming an identity within the complex, interconnected Indian family and culture. The question we asked was: How is an eastern, family-oriented, We-self different from a western, individually-oriented I-self? What are the personal, social, and spiritual implications of such differences? We continue to dialogue on this topic and Robert brings his seventeen visits to India on the subject. After our trip to India Robert was visiting me that Spring at my home in No. California. One afternoon while we were in the kitchen, Robert casually blurted out: "I want to leave you my best." The weight of his statement practically knocked me over. Fortunately, I was supported and held upright by the strong kitchen counter behind me. Robert's best was quite a lot. Initially, it overwhelmed me with the responsibility and honor of carrying on some of his work. He didn't discuss it any further on that visit. A couple of years later, my intuitive and visionary friend, Kazimierz Gozdz, suggested that Robert and I write a book together. He offered to set up a meeting to introduce the project and help provide the structure, as he was an editor and had written his book on organizational psychology under the tutelage of Scott Peck, author of The Road Less Traveled. Writing a book with Robert Johnson would be an enormous undertaking. Was I up to it? My mind had a variety of reactions, but in my heart and gut I knew it was right, and the time had come for Robert to leave me "his best." Doing a book together was the ideal container to transfer his refined knowledge about a topic we were both deeply engaged in as well as initiate me into authorship. We are collecting our experiences, stories, and research we've done in the last ten years. Our trip to India was a milestone and should provide much insight. We are writing about the wholeness-making process from western psychological viewpoints as well as Indian spiritual viewpoints. Essentially we are asking: How does culture, particularly the Indian (Eastern) and North American (Western) culture influence the development of the ego-identity, psyche, and therefore the psychospiritual journey, or what Carl Jung called, individuation? In short, how is an eastern self's journey towards self-realization different than a western self's journey? We look forward to publishing in early 2002.